On Saturday I had the opportunity to teach my dear friend Greg some jewelry making skills. then doming them in a dapping block. 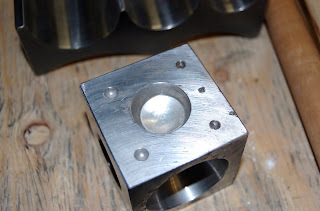 Then Greg textured the metal with a ball bur at my bench. 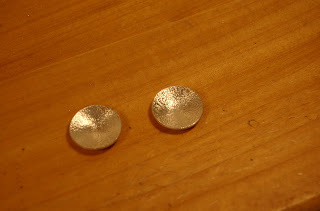 We had two perfectly textured silver domes. 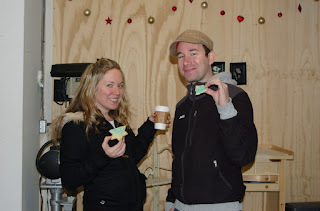 Then Greg's partner Dave and our beautiful friend Becky came by with Hanukkah Cookies. I let Greg take a short cookie break and then I made him get right back to work. Like any good teacher I made sure to always look sternly over his shoulder while he worked. 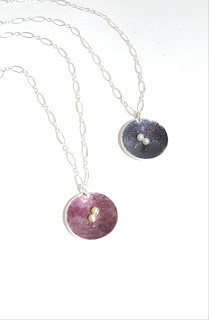 Of course, no jewelry would be complete without a little bit of colour. 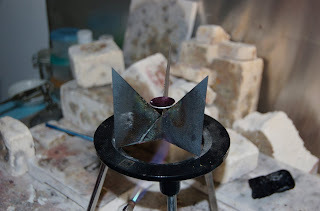 and then torch fired the piece. Here are the finished pendants. Nice Job Greg! It was so much fun having you work in my studio with me! New York in the Winter?